HuntingClothesPro: Best Wild Turkey Recipe Ever! Yum! Yum! With turkey season here or just right around the corner depending on where you are. Some people aren't sure how to cook wild turkey. When I talk about making some wild turkey, I always get asked "doesn't it always taste gaming and it dries out". I tell them it can if you don't season it right or don't keep the meat moist when cooking it. 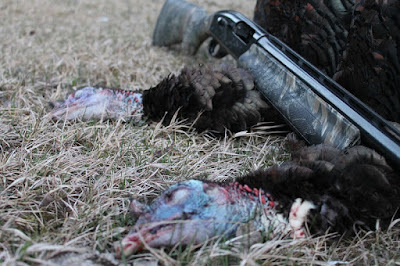 Here is one of my favorite wild turkey recipes. Cut the turkey into pieces across the grain. Then cook the onions in a pot until tender in margarine and all the other ingredients to mixture. Bring pot to full boil. Cover each piece of the turkey with this mixture and continue to base the turkey on the grill for 45-55 minutes. If you haven't tried this recipe before you have to give it a try. It is an all time favorite of my family's and for the ones that don't hunt, they can't even tell it's a wild turkey. Which is a bonus for us. If you would like to see more wild turkey recipes, you can check them out here! This recipe came from The Big Game Hunting.